Cupcakes are dainty, cute and very popular. I can definitely see what all the hype is about. They are so much easier to make then an actual cake, they make a beautiful presentation and are individual portions, and you don’t even need a plate to eat them. Maybe you haven’t quite got the hang of piping frosting in pretty swirls, or maybe you want a fun project to make do with your kids. How about decorating the cupcakes with candy? You might even make it into a really cool trip to a candy store and go through all those colorful options to choose whatever you think might look nice on top of the cupcakes. I don’t have any kids to blame this project on, but I sure had a great time making them:). 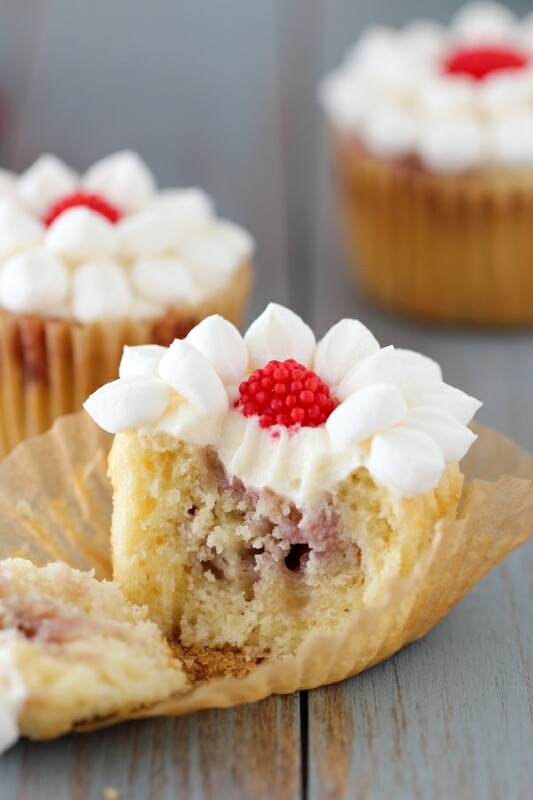 These raspberry swirl cupcakes are so tender and moist, they taste so great, they would be awesome even without any frosting. 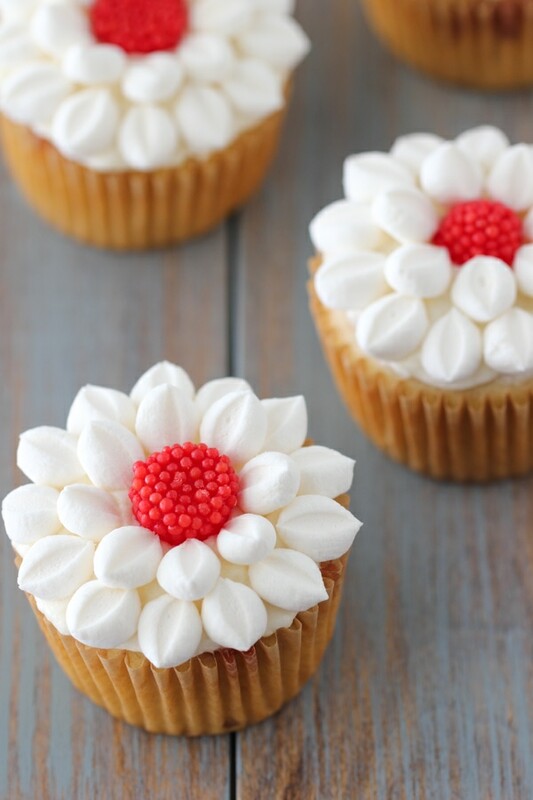 The fluffy cream cheese frosting is my favorite to use on all the cupcakes that I make and the candy decorations form really elegant flowers. I hope you have just as much fun making these cupcakes as I did. Preheat the oven to 350 degrees Fahrenheit. Line 18 muffin/cupcake baking pans with cupcake liners. 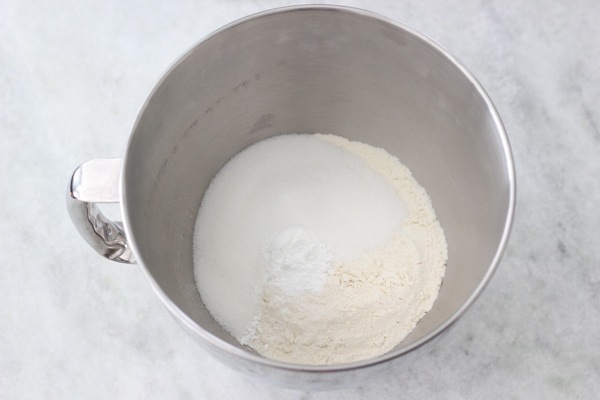 In a large bowl of a standing mixer or a large bowl and a hand mixer, place the flour, sugar, baking powder and salt. Mix to combine. 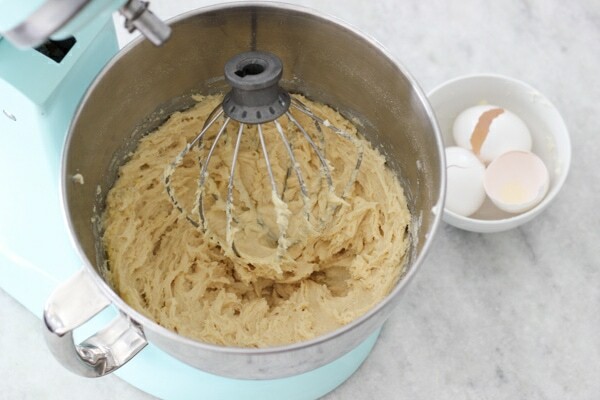 Turn the mixer on low speed and add the butter one piece at a time, until the mixture looks like wet sand. Add the eggs one at a time, mixing until the mixture comes together, being careful not to over mix. 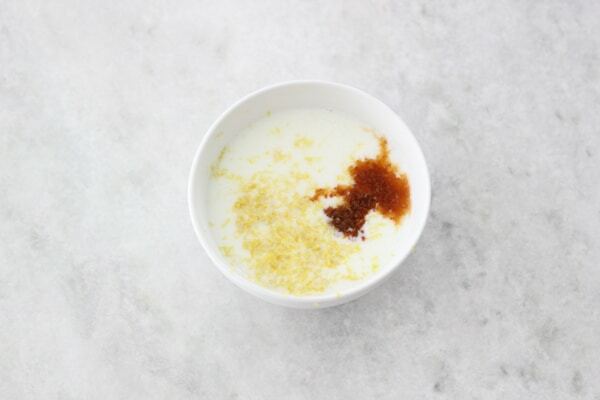 Add the buttermilk, lemon zest and vanilla extract. (I usually just mix them together in a medium bowl.) Mix on medium speed until the cupcake batter is smooth. Divide the batter between 18 cupcake liners. 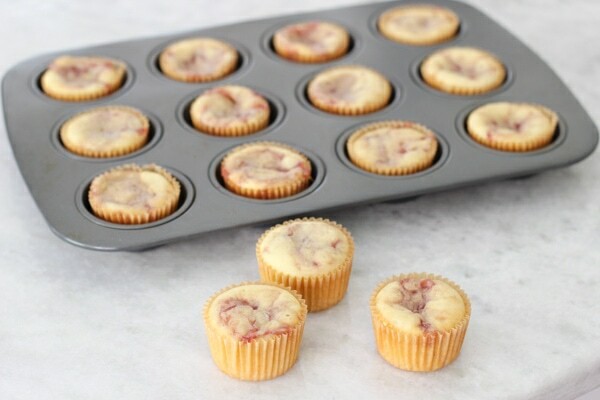 Add about 1/2 a Tablespoon of raspberry jam to the center of each cupcake and then swirl the jam in the batter with a toothpick or a butterknife to distribute it. If the jam is really stiff, you can warm it up for a few seconds in the microwave or on the stovetop. Bake the cupcakes in the preheated oven for 18-20 minutes. Cool completely. Meanwhile, make the frosting. 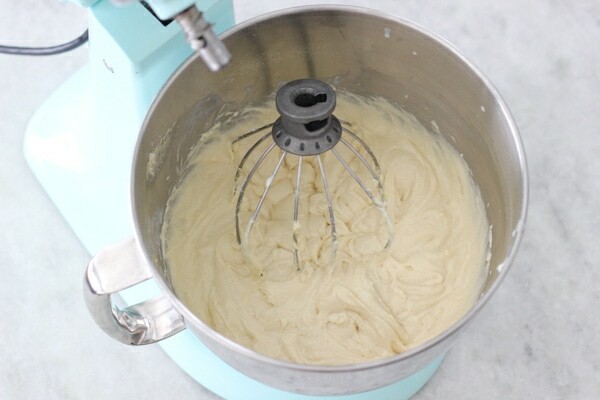 Using a standing mixer or a hand mixer, mix the cream cheese and butter until smooth and then add the confectioner’s sugar and vanilla extract, starting on low speed at first, or else you’ll have a cloud of sugar all over the kitchen. 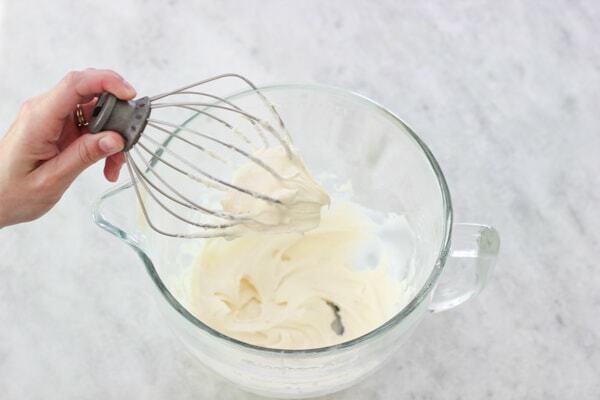 Gradually increase the speed until the frosting is smooth and fluffy. 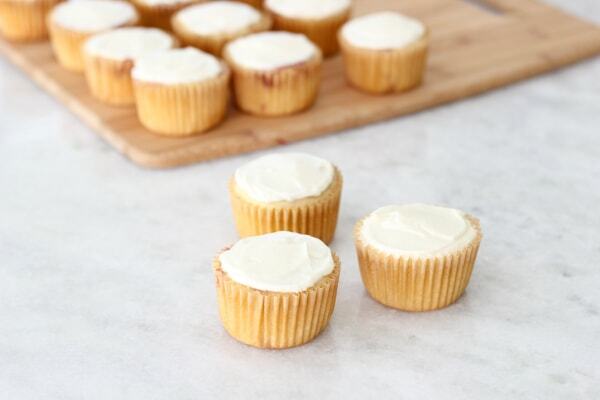 When the cupcakes are completely cool, use a small offset spatula or a butter knife to frost the top of the cupcakes. Since we will be decorating the cupcakes with candy, we only need enough frosting to hold the candy in place. Now it’s time to decorate. You can get as creative as you want with whatever candy that looks good to you. 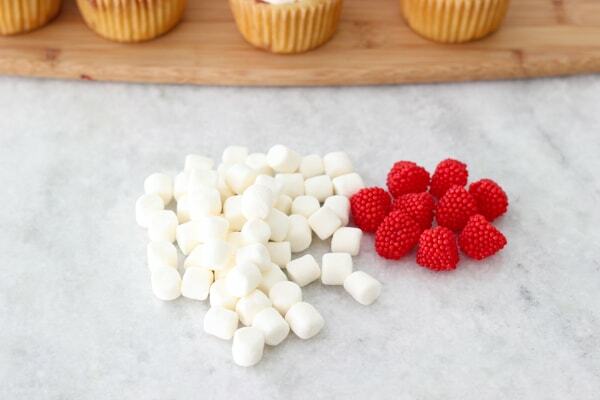 I kept it simple and used these mini marshmallows and raspberry shaped gumdrops. 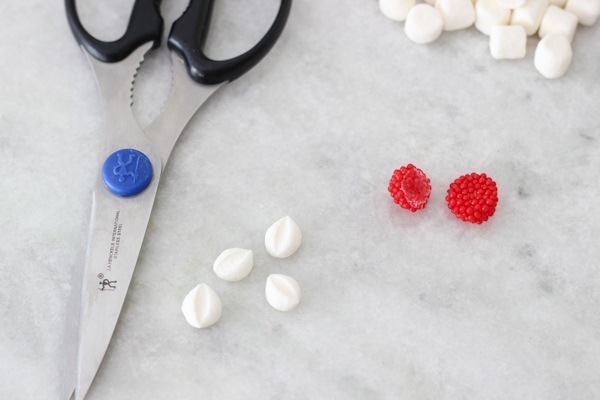 Cut the mini marshmallows in half with scissors and cut the gumdrops in half with a sharp knife. Place the gumdrop halves in the center of the cupcakes and then place the mini marshmallows, cut side up, around the cupcakes, in a circular pattern. Isn’t this a beautiful presentation? I think these cupcakes would be perfect for a shower or birthday party. 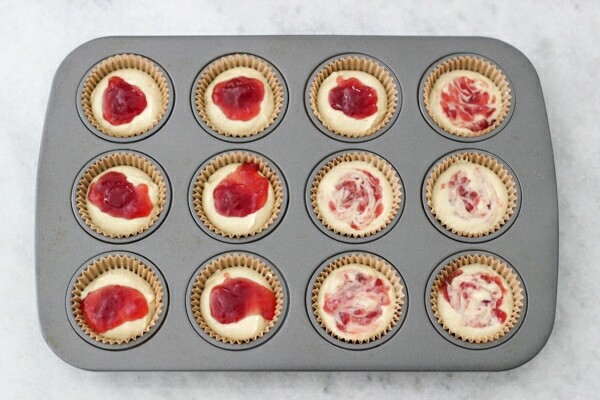 Divide the batter between 18 cupcake liners. 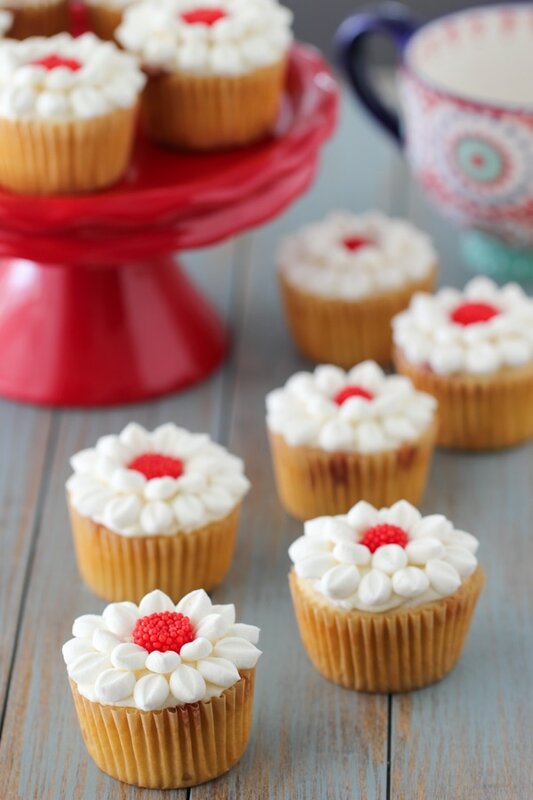 Add about ½ a Tablespoon of raspberry jam to the center of each cupcake and then swirl the jam in the batter with a toothpick or a butterknife to distribute it. Bake the cupcakes in the preheated oven for 18-20 minutes. Cool completely. Meanwhile, make the frosting. 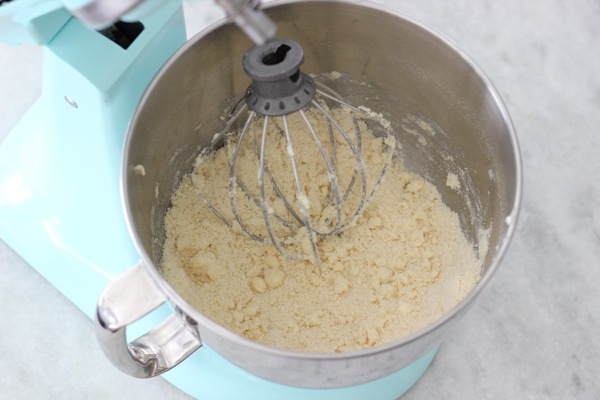 Using a standing mixer or a hand mixer, mix the cream cheese and butter until smooth and then add the confectioner's sugar and vanilla extract, starting on low speed at first, or else you'll have a cloud of sugar all over the kitchen. 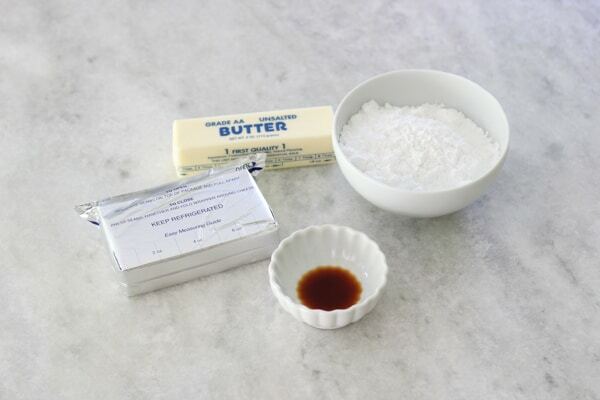 Gradually increase the speed until the frosting is smooth and fluffy. 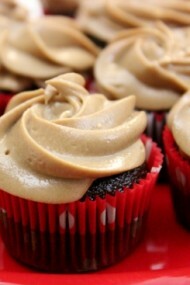 When the cupcakes are completely cool, use a small offset spatula or a butter knife to frost the top of the cupcakes. Since we will be decorating the cupcakes with candy, we only need enough frosting to hold the candy in place. Cut the mini marshmallows in half with scissors and cut the gumdrops in half with a sharp knife. Place the gumdrop halves in the center of the cupcakes and then place the mini marshmallows, cut side up, around the cupcakes, in a circular pattern. Olya, Your post is so timely. My daughter requested cupcakes and she wanted “white and chocolate” for her Birthday because “some of my friends don’t like chocolate”. I so appreciate your recipes!!!! I’ve made so many of them and they always out good. 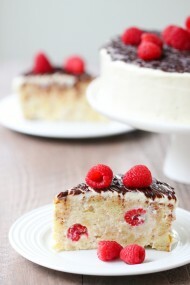 So easy, yummy and beautiful. I love your decorating tip. She’s going to be delighted that she won’t have to pipette these, Thank you! Hi Olga, is it safe to replace the buttermilk ingredient with regular milk? Yes, you can use regular milk, Nina. They will have a slightly different texture though. I’m glad you enjoyed them, Nina. Where did you get this recipe or how did you make up this recipe? When I watched your video “Thanksgiving Decor and Party Planning Tips”, you said you’re not the stunning person. 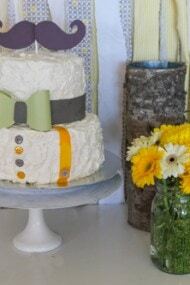 But When I look at your recipes I say to myself “you are stunning decorator! !” I wish I can decorate as gorgeous as you do. 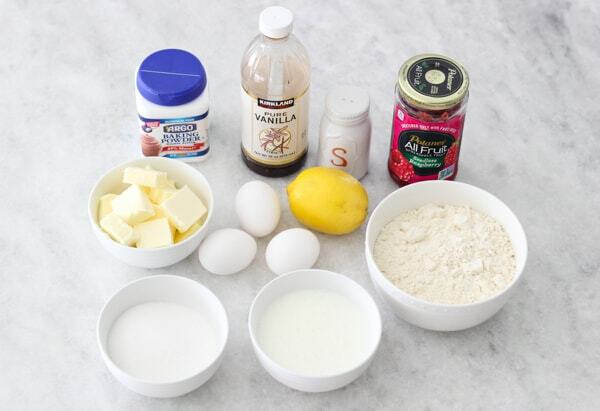 I just used the recipe that I use for simple vanilla cupcakes and added raspberry jam to them. Thank you so much for the kind words, Lana. These look so beautiful! I will definitely come back to this if ever in need of a cupcake recipe. Thank you! These are just too adorable!!! 🙂 I can’t wait to make them! Thank you, Natalie. I hope you enjoy them.